SL Inspector General of Police, Pujith Jayasundara, who recently vowed to clamp down on the elements carrying weapons, finds himself comfortable with Karuna's men firing cows in the pasturelands as the Sinhala system is waging a shadow war against the Tamil dairy farmers in Paduvaan-karai, the dairy farmers complained. The SL Police is refusing to act against the former paramilitary men who are in possession of T56 assault rifles at the pasture lands, they told TamilNet on Friday. The police were also trying to re-introduce a war-time ‘pass system’ to control dairy farmers access to pasture lands in the recent weeks. The move was blocked by Tamil civil servants advising the dairy farmers not to apply for any such ‘police permits’. The dairy farmers from Kiraan, Chiththaa'ndi, Koara-kalli-madu and Chanthi-ve'li complain that their traditional livelihood is severely threatened by the Sinhala encroachment as well as the new threat coming from the ex-paramilitary. The cows frequent the tank at Paalai-madu from a grazing land area of 200 acres in its vicinity, they said. It was the SL Forest Department of the unitary state mechanism in Colombo, which comes under the direct supervision of the SL President, that provided ‘permission’ to Karuna Group to clear 20 acres of forest lands along the grazing lands. Vinayagmoorthy Muralitharan alias Karuna has already promised to transfer 550 acres of lands in the area to his supporters from Kiraan to operate Perum-poakam agriculture using the monsoon rains. 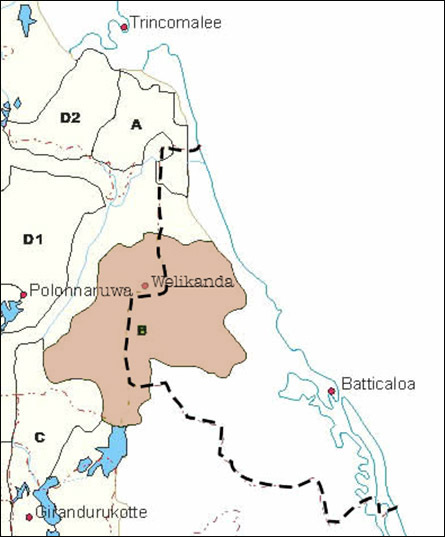 Meanwhile, the SL President is targeting to absorb tens of thousands of acres of lands in Paduvaan-karai region into his Mahaweli Authority, with the aim of expanding Sinhala settlements from Polonnaruwa district in the North Central Province eastward through new irrigation systems. The armed paramilitary, which was deployed in the genocidal war against the nation of Eezham Tamils is now being used as a tool of structural genocide, the farmers complain.